reQuire, LLC is the largest provider of mortgage lien release tracking services and title curative services in the United States. The company’s Release Tracking Service, a Web-based system, allows attorneys, settlement agents, and title companies to track, report, and obtain real estate mortgage lien releases. It provides release tracking and reporting, and title curative services. The company was founded in 2002 and is based in Virginia Beach, Virginia. reQuire was listed on Inc. Magazine’s list of Fastest-Growing Private Companies in 2011. 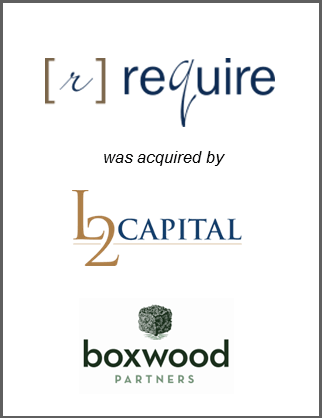 Boxwood Partners acted as the exclusive advisor to reQuire, LLC in sale to L2 Capital Partners.